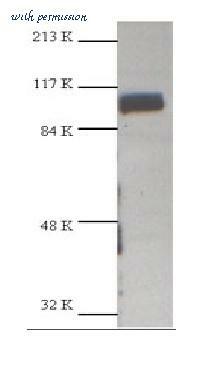 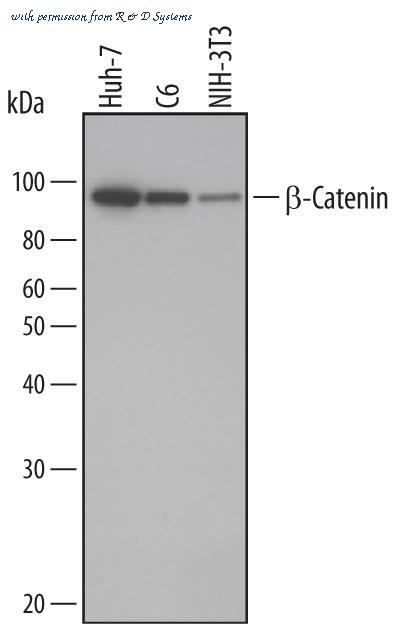 Western blot analysis of beta-Catenin was performed by loading 50µg of the indicated whole cell lysates onto a 4-20% Tris-HCl polyacrylamide gel. 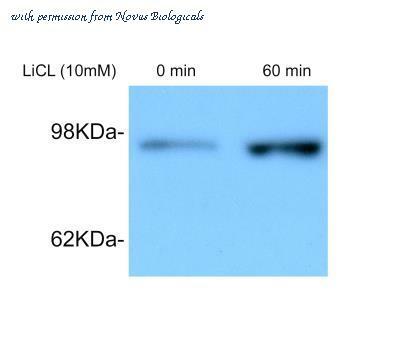 Proteins were transferred to a PVDF membrane and blocked with 5% BSA/TBST for at least 1 hour. 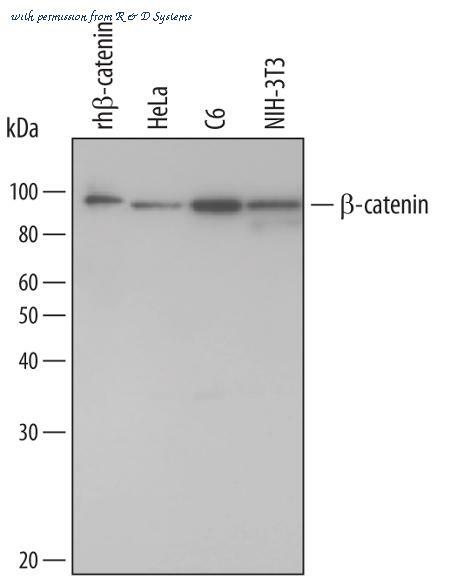 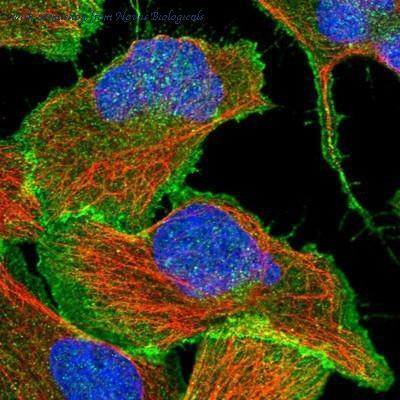 The membrane was probed with a beta-Catenin monoclonal antibody (Product # MA1-301) at a dilution of 1:1000 overnight at 4°C on a rocking platform, washed in TBS-0.1%Tween 20, and probed with a goat anti-mouse IgG-HRP secondary antibody (Product # 31430) at a dilution of 1:20,000 for at least 1 hour. 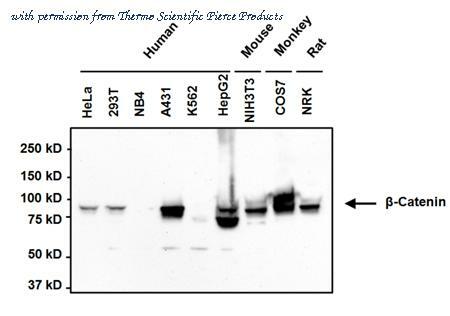 Chemiluminescent detection was performed using SuperSignal West Pico (Product # 34080). 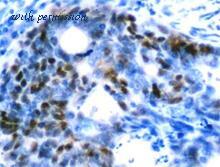 Immunohistochemistry was performed on cancer biopsies of deparaffinized Human colon carcinoma tissue. 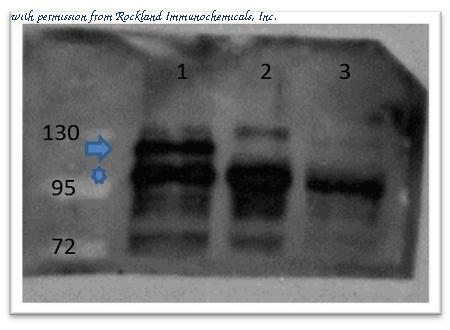 To expose target proteins, heat induced antigen retrieval was performed using 10mM sodium citrate (pH6.0) buffer, microwaved for 8-15 minutes. 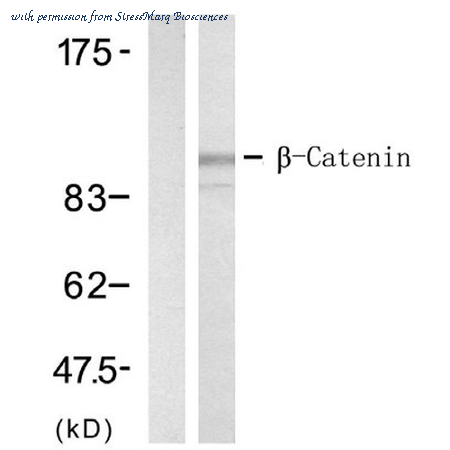 Following antigen retrieval tissues were blocked in 3% BSA-PBS for 30 minutes at room temperature and probed with a Catenin beta monoclonal antibody (Product # MA1-301) at a dilution of 1:200 or without primary antibody (negative control) overnight at 4°C in a humidified chamber. 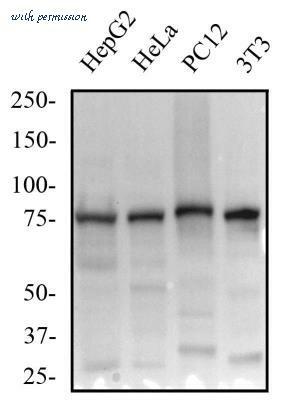 Tissues were washed with PBST and endogenous peroxidase activity was quenched with a peroxidase suppressor. 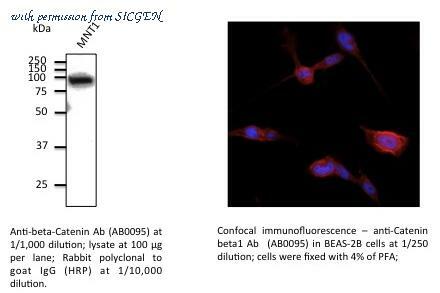 Detection was performed using a biotin-conjugated secondary antibody and SA-HRP, followed by colorimetric detection using DAB. 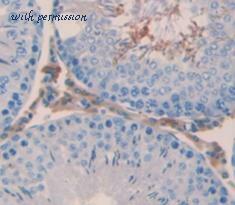 Tissues were counterstained with hematoxylin and prepped for mounting. 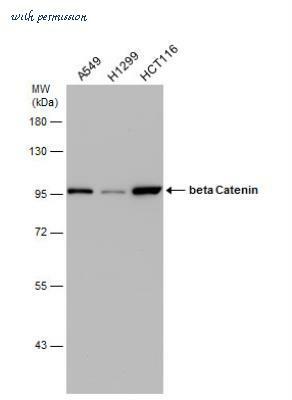 Western blot analysis of HeLa Whole Cell Lysate using PA5-19469, beta Catenin primary antibody at a dilution of 1 ug/ml (lane 1). 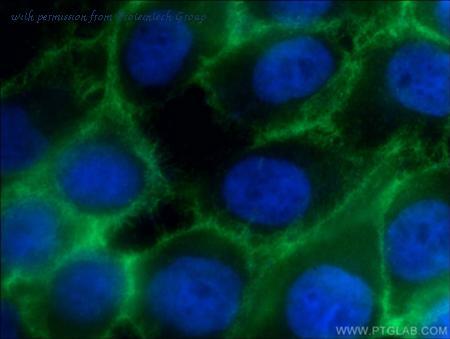 PA5-19469 staining of NIH 3T3 Whole Cell Lysate at a dilution of 1 ug/ml (lane 2). 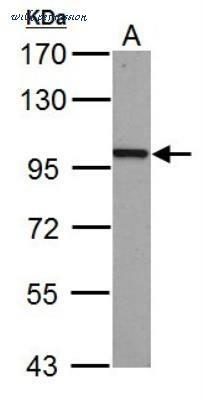 Blot treated with a secondary HRP-conjugated Goat polyclonal anti-Rabbit antibody was used at a dilution of 1:3000. 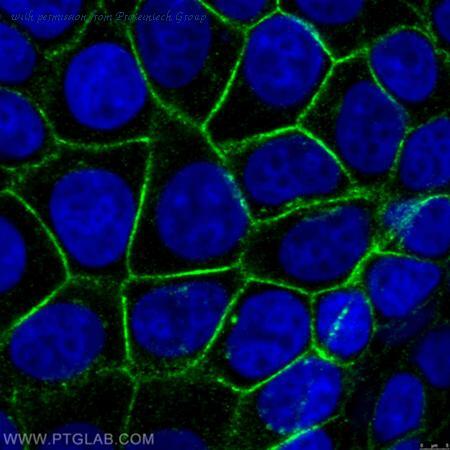 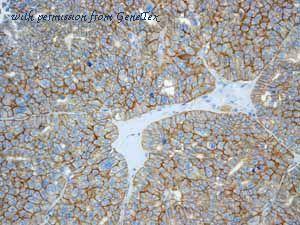 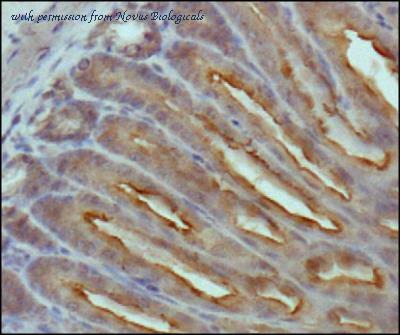 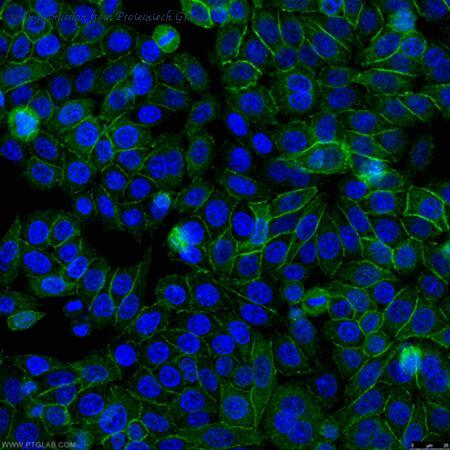 Immunohistochemical (formalin-fixed, paraffin-embedded) staining of Human Liver tissue using PA5-19469, anti-Beta Catenin antibody. 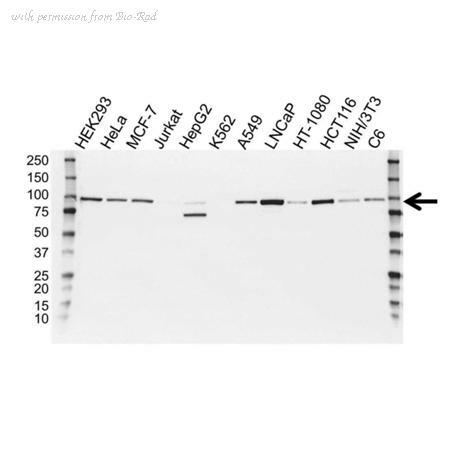 Primary antibody was used at a concentration of 1ug/ml and exposed for 15 mins at room temp. 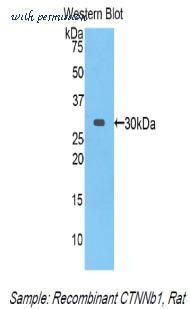 The sample was pretreated using heat mediated antigen retrieval with Sodium Citrate Buffer (pH6 / 20mins). 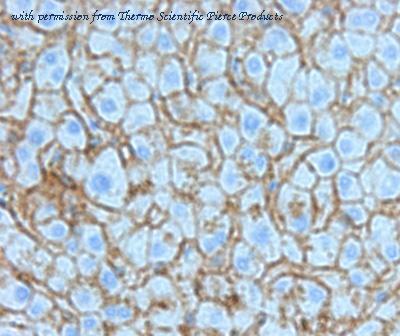 The detection method was a HRP conjugated polymer, DAB chromogen and the sample was counterstained with haematoxylin and mounted with DPX. 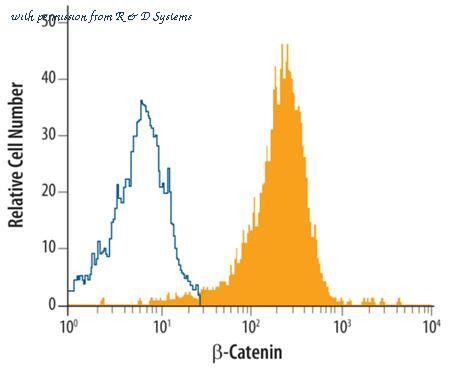 Immunohistochemical detection of colorectal cancer beta-catenin on paraffin embedded sections with beta-catenin mAb (12F7). 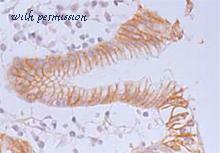 Immunohistochemical detection of gastric epithelium beta-catenin on paraffin embedded sections with beta-Catenin mAb (12F7).